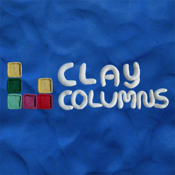 Clay Columns is a dynamic action game with a simple yet addictive game play. Align three or more blocks of the same color in vertical, horizontal or diagonal line to score. - Tap screen to change order of falling blocks. - Drag left/right to move falling blocks. - Flick down to drop falling blocks. + Cool clay graphics with Retina support! + Simple yet addictive game play!